We are immensely proud of the team that make Hever Castle & Gardens such a success. From those you see out in the gardens and Castle, to those typing away in the offices – thank you. Our hard work has been recognised by various organisations this year so we wanted to share the good news with you. Please read about our recent award wins below. The childhood home of Anne Boleyn was given the accolade of Best Family Day Out at a prestigious ceremony at Grocers’ Hall in London on Monday 25 March. The event recognised the country’s heritage industry with a judging panel from across the sector. Winning Best Family Day Out was a celebration of the regular programme of events throughout the year at Hever Castle with events including jousting and Halloween half term as well as the play areas. Click here to find out more about the events at Hever Castle to keep your little ones occupied. We’ve also got three playgrounds, two mazes and plenty of space to run around! Hever Castle & Gardens has been named best Castle Wedding Venue at the UK Wedding Awards. The childhood home of Anne Boleyn beat off competition from Amberley Castle, Clearwell Castle, Warwick Castle, Augill Castle, Culzean Castle, Dundas Castle, Farnham Castle, Glenapp Castle, Pendennis Castle and Rowton Castle to be named best Castle Wedding Venue in the UK. The UK Wedding Awards is organised by Hitched and You & Your Wedding to recognise the best of the UK wedding industry. You can find out more information about Hever Castle as a wedding venue on the ‘weddings’ section of the website or contact the team on weddings@hevercastle.co.uk / 01732 861800. Best Castle Wedding Venue at the British Wedding Awards. Hever Castle & Gardens has been named best Castle Wedding Venue at the British Wedding Awards. The childhood home of Anne Boleyn was given the top accolade at the black tie event at the Royal Horseguards and One Whitehall Place in London on Thursday 21 February. Warwick Castle was highly commended. The awards, which are in their 11th year, are voted for by brides. They were created to champion excellence in all things bridal; from stationery to shoes, dresses to destinations. The historic attraction received a bronze award in the Large Visitor Attraction of the Year category with Fishers Adventure Farm in West Sussex gaining silver and the Mary Rose Museum in Portsmouth being awarded gold. Bombay Sapphire Distillery in Hampshire, British Airways i360 in Brighton and Waddesdon Manor in Buckinghamshire were highly commended in the same category. 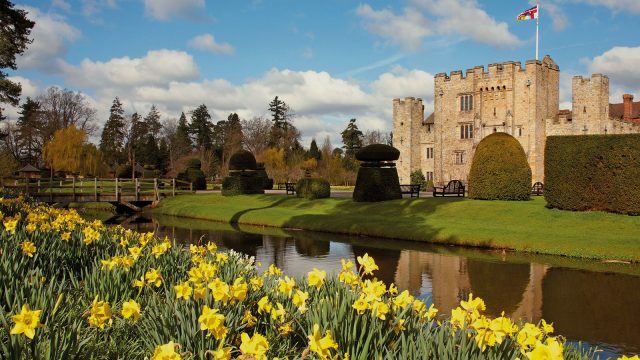 Discover more about visiting Hever Castle here. Hever Castle’s luxury holiday cottage, Medley Court, is one of the top places to stay in the UK, according to VisitEngland. The 5* four bedroom house was named as a recipient of the annual ROSE award in 2018. The fourth annual award recognises the owners, management and employees of establishments that go the extra mile in order to provide excellent customer service. The award can only be won once and features just 100 accommodation providers a year. Hever Castle & Gardens were named Best Wedding Venue at the inaugural 2018 National Venue Awards. Nominees for the Best Wedding Venue category included Blenheim Palace, Luton Hoo Hotel, Golf & Spa, Mottram Hall, Waldorf Astoria Edinburgh – The Caledonian and Whittlebury Hall Hotel & Spa, making the win for Hever Castle even more prestigious. Be it the stately grandeur of the Castle itself, the country house atmosphere of the Astor Wing, or the stunning lakeside location of the Guthrie Pavilion, Hever Castle offers a dream-come-true location for your special day. Intimate gatherings, exuberant parties and outdoor weddings are all catered for. Our luxury 5* Bed and Breakfast scooped silver in Boutique Guest Accommodation of the Year at the 2018 Visit England Awards. The luxury accommodation was pipped to the Gold spot by Yorebridge House in North Yorkshire. Cary Arms & Spa in Devon won bronze. As a result of winning Gold at the Beautiful South Awards in 2017, Hever Castle was eligible to enter the national Visit England Awards. You can find out more information about our Bed and Breakfast on the ‘stay’ section of the website or contact the team on stay@hevercastle.co.uk / 01732 861800. Hever Castle beat off stiff competition from Blanch House in Brighton, Port Lympne Hotel in Kent and The Montagu Arms Hotel in Hampshire to gain the Gold award. Gravetye Manor Hotel & Restaurant in West Sussex and the Milk House in Kent were highly commended. The Gold award allows Hever Castle to enter the same category for the Visit England Awards for Excellence which takes place in 2018. Hever Castle’s luxury 5* Bed and Breakfast was named Best Boutique Stay in Kent at The Muddy Stilettos Awards 2018. The awards ceremony was held at the charming Chapel Down in Tenterden and involved numerous other local businesses being awarded for their hard work. This particular award is voted for by the public so a huge thank you goes out to everyone who voted for us! Hever Castle & Gardens won the award for the ‘most fun family day out’ at the annual SO Lifestyle Awards 2018. Over 20,000 votes were cast so we feel incredibly honoured to have won this local award. Hever Castle & Gardens was recently named a finalist in the ‘Best Historic House or Garden for Groups’ category at The 2018 Group Travel Awards. At the awards ceremony on Friday 1 June, we were pipped to the post by winner Blenheim Palace and runner up Hampton Court Palace. However, we were truly overjoyed that readers of GTO magazine voted for Hever Castle as a top place for groups to visit. The Group Travel Awards are a highlight of the group travel industry’s year and an acknowledgement of the importance of group travel to tourism. Whether you are a group travel organiser, a teacher, or member of the travel trade planning trips and tours in Kent, there is a selection of experiences and packages to suit the interests and needs of groups and schools alike. We have a dedicated member of staff who will assist you with your planning and will guide you every step of the way to ensure that your group visit is a memorable one. Find out more about our group packages here. Other finalists included Port Lympne Hotel & Reserve and Howletts Wild Animal Park and Biddenden Vineyards. The category was judged by Mark Anderson, Head of Marketing at Southeastern rail. We were shortlisted as a finalist in the Times of Tunbridge Wells Business Awards 2018 in the Best Business 25+ category. The South & South East in Bloom is the largest horticultural campaign in the region involving 100’s of communities each year. Participating communities create lasting improvements to their local environment for the benefit of those that live, work and visit. 2017 – Gold Award, plus young gardener of the year for Josh Fenn and Horticulture Achievement Award for Neil Miller. Find out more about our gardens here. Hever Castle’s luxury Bed and Breakfast has maintained its 5* Gold status and a Breakfast award in 2018. The accommodation was assessed by Visit England and got a 95% quality score. To gain a 5* rating businesses have to score between 85% and 100% and are marked on bedrooms, bathrooms, cleanliness, hospitality and breakfast. The Gold award is giving to accommodation which offer the `best of the best’ and the Breakfast Awards recognises breakfasts which exceed guest expectations. Hever Castle & Gardens in Kent has been awarded a TripAdvisor® Certificate of Excellence as both a Visitor Attraction and for its Luxury Bed & Breakfast accommodation for the fourth year running. Now in its seventh year, the achievement celebrates hospitality businesses that have earned great traveller reviews on TripAdvisor over the past year. Certificate of Excellence recipients include accommodation, eateries and attractions located all over the world that have continually delivered a quality customer experience. The Certificate of Excellence is based on reviews submitted by travellers on TripAdvisor over a 12-month period. To qualify, a business must maintain an overall TripAdvisor bubble rating of at least four out of five, have a minimum number of reviews and must have been listed on TripAdvisor for at least 12 months. The award means the accommodation at Hever Castle is in the top 5% in the United Kingdom for Customer Satisfaction. You can also find out more information about our Bed and Breakfast on the ‘stay’ section of the website or contact the team on stay@hevercastle.co.uk / 01732 861800. Hever Castle has been awarded a ‘Champions of Perennial Award’ in recognition of all the charity work the Hever Castle gardeners have participated in over the last year. Memorably the gardeners assisted in the landscaping of a large show garden, ‘A Growing Obsession’, at the RHS Hampton Court Palace Flower Show – an opportunity which the Hever Castle gardeners relished. Perennial has been helping horticulturists in need for 175 years. The charity provides free and confidential advice, support and financial assistance to people of all ages working in, or retired from, horticulture. This help extends to spouses, partners and children.